We love food. That is something that is always safe to assume. People love eating, trying new recipes, and heading to new and trendy restaurants. But all of those smothered burritos, fried chicken sandwiches, and deep dish pizzas will have an effect on your body. Sure, these food choices are not healthy and can lead to weight problems or make you feel sick if consumed too often, but they can also change the way your skin looks. Some foods can make your skin break out and look unhealthy. You have probably noticed more acne breakouts when you add different foods to your diet. You have learned what to avoid and what to limit yourself on. If you need more information about what food to avoid for clearer skin, check out the blog, Foods That Trigger Acne Breakouts: Part One and Part Two. Keeping your skin clear and healthy can be as simple as avoiding certain foods and using the right products for your skin. But there are many others things that can help your skin look and feel healthier as well. While some foods should be avoided, there are different foods that can improve the health of your skin. They may not be as tasty as some of the foods you should avoid, but they can keep you and your skin in better shape. Healthy skin doesn’t have to be hard to obtain, but many people do not know how to best care for their skin. At Azeal Dermatology Institute, we strive to help all of our patients get the healthy and beautiful skin they want. We offer many different services and treatments that can help improve the quality of your skin. Our knowledgeable, trusted, and professional dermatologists in Boulder provide treatments that can help many different skin problems and concerns. If you want to give your skin a boost of health and beauty, schedule an appointment at our Boulder dermatology office today! We are all about helping out patients get the healthiest skin possible and we will help you learn more about your skin type and how to best care for it. Besides using the right products and following different skin care routines, you can change your diet to give your skin a healthier glow. In this blog, we are going to cover some of the food that you should add to your diet. Broccoli is not at the top of many people’s list of favorite foods. The veggie that resembles a miniature tree does offer benefits that may change that though. Broccoli is packed full of vitamins and minerals that can help improve skin health, including vitamins A, C, and zinc. Vitamin C is important to get in your diet because it is needed to produce collagen. According to a Healthline blog, broccoli florets contain sulforaphane. This compound offers many different health benefits, including having anti-cancer effects. When it comes to your skin, sulforaphane can help protect against sun and prevent sun damage. It is able to protect against sun damage because is neutralizes harmful free radicals. The Healthline article also mentions that broccoli contains lutein, which is a carotenoid that works like beta-carotene, helping to protect your skin against oxidative damage. Oxidative damage can cause your skin to become dry and wrinkled, so broccoli helps keep skin hydrated and smooth. While many people may not enjoy eating raw broccoli, there are many different ways to make this a delicious and nutritious part of your diet. Steam some broccoli and season with lemon pepper. This is an easy way to get your daily dose of broccoli. You probably know that fish contains omega-3 fatty acids, but did you know that this fatty acid is important in maintaining skin health? Omega-3 fatty acids help to keep your skin thick and moisturized, keeping it looking and feeling younger. It also helps to reduce inflammation and make your skin less sensitive to UV rays from the sun. Many of the vitamins and minerals that are found in fish offer relief from inflammation, helping to improve the overall health of the skin. Vitamin E is also found in many fatty fishes, which is an antioxidant that can help protect the skin against free radicals and inflammation. 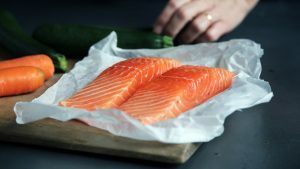 Wild salmon, mackerel, and herring are great choices when trying to get the best skin benefits. Bake some fish with seasonings for a tasty and healthy dinner. Add some broccoli on the side and give your skin a tasty makeover! Tomatoes contain vitamin C, as well as the major carotenoids. Many of these carotenoids have been shown to offer protection against sun damage, helping the skin stay healthy and looking more youthful. Tomatoes are great for maintaining healthy and beautiful skin. The Healthline article also mentions that the carotenoids need fat in order to be absorbed. This is simple when you pair your tomatoes with something like olive oil. Add tomatoes to your salad, order bruschetta with your meal, or just eat slices of tomatoes to get these skin benefits! Bell peppers are a delicious addition to many meals, but they are also a great source of beta-carotene. Red bell peppers contains about 92 percent of the recommended daily intake of vitamin A. Vitamin C can also be found in bell peppers, allowing them to help keep your skin firm and smooth. Vitamin C is necessary when it comes to producing collagen. So, as mentioned above, get plenty of vitamin C! According to Fitness Magazine, that green, yellow, and orange bell peppers can help to reduce the appearance of wrinkles. A study found that women who ate these colorful veggies generally had fewer wrinkles, especially around the eyes. These peppers are also able to reduce the skin’s sensitivity to the sun. Bell peppers are easy to add to just about any dish. Throw them in your fajitas, add them to a salad, or eat them plain. These tasty veggies are great any way! Sunflower seeds, along with other nuts and seeds, are great for the skin. They are excellent sources of vitamin E, which can protect your skin from the sun, keeping it looking younger. Sunflower seeds contain the antioxidant selenium, zinc, and protein. According to BBC Good Food, selenium can protect your skin against sun damage, age spots, and skin cancer. This powerful antioxidant is a great way to keep your skin healthy and can be found in many nuts. Another great way to get enough selenium is to eat Brazil nuts. Only four nuts can give your the recommended daily amount of selenium. 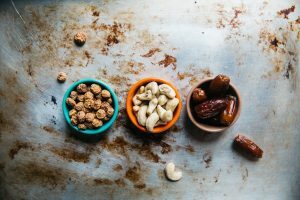 Sunflowers are a great to snack on throughout the day, and other nuts are easy to keep at your desk for a quick snack that offers many benefits. Avocados are a popular food choice and high in healthy fats. These fats are beneficial for your skin and can help improve the overall health. Avocados, and other foods containing healthy fats, can help add moisture and suppleness to your skin. Like many other foods on this list, avocados can help protect your skin from sun damage, helping to keep your skin looking younger longer. Vitamins E and C are also found in avocados. They work to protect the skin from oxidative damage and creating more collagen. These two vitamins offer many different skin benefits and are necessary for hydrated and happy skin. According to the Healthline article, half of an avocado can provide 10 percent of the recommended daily amount of vitamin E and 17 percent of the daily dose of vitamin C.
Avocado toast has been trending among the foodies lately. But there is no wrong way to eat an avocado. Slice it up and add a little salt, put some salad dressing on it, or add it to your salad for even more flavor! Finally, something on the list that we can all be happy about! Chocolate, specifically dark chocolate, contains a type of antioxidant called flavonols. This antioxidant help to thicken and hydrate skin, leaving your skin looking and feeling healthier. 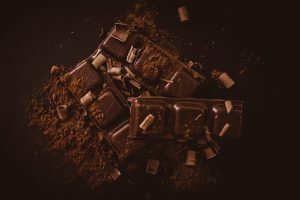 The Healthline article mentions a study, where participants who consumed cocoa powder high in antioxidants, experienced less dry and scaly skin, were less sensitive to sunburns, and had better blood flow. Dark chocolate can help protect your skin from UV rays from the sun and may even be able to help with wrinkles. Eating chocolate with at least 70 percent cocoa will help you get the most out of your chocolate. You all know how to eat chocolate, so we don’t have to give you tips. But make sure you try to stick with chocolate that is 70 percent cocoa! There are a few of the many different foods that can help you get healthy skin. These foods add important vitamins, minerals, and antioxidants into your diet, improving your overall health along with the health of your skin. While these may not be your go to food choices, they are good to add to your diet and can be very beneficial. Who knew skin care was more than just finding the right products? Adding these foods to your diet can offer many different skin benefits. Changing your diet can do a lot more than simply make you feel healthy. It can benefit you mentally, emotionally, and physically. Improve your body and skin by adding these beneficial foods to your diet! If you want to improve the health of your skin further, you can head to your Boulder dermatology specialists. At Azeal Dermatology Institute, we offer the best skin care services and treatments, helping you get the skin you truly want. Learn more about our services and schedule your appointment today!